Cottage Grove High School is a part of the South Lane School District, which came into existence in July, 1961, as a result of the consolidation of the Union High School District and several elementary districts. Cottage Grove High School was planned and organized in 1938, when seventeen smaller districts voted to unite in order to provide a more adequate education for their students. Classes were first held as a four year high school in the Taylor Avenue high school building in April of 1940. The covered football stadium and Currin Field were added in 1951. This stadium was torn down in 1996 when it was declared unsafe and bleachers were brought in to replace it. The swimming pool was added in 1955. Classrooms 20-25 were added to the west end of the building in 1956, as well as the main gym and music room on the east end. The science wing on the south side was opened in 1960 and the vocational building on Eighth Street became a part of the campus in 1966. Two modular classrooms were added for science to the west end of the building in the late 1980′s. Cottage Grove High School became a three year high school in 1963 and in 1990 again became a four year high school. Ten modular classrooms were added on the west end to accomodate the additional students. Room 11 became a part of the library and room 10 became a the student service center. In the Spring, 2000 election, voters in South Lane County decided that it was time for the building to be replaced. 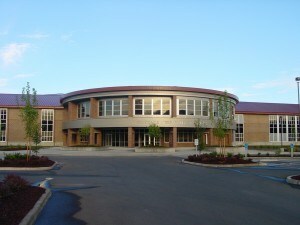 Students now attend the new Cottage Grove High School at 1375 South River Road, opened September 3rd, 2003. It is a four year high school where apporximately 850 students are enrolled. Athletic teams are part of the Sky Em league and the new state-of-the-art athletic complex is being used for various events by the Sky Em league and OSAA. Destruction of the old building at 1000 Taylor Avenue began in March, 2004, with the exception of the modular classrooms and the vocational building, which now houses Kennedy Alternative High School. The property will be retained by the district as soccer fields until the district is ready to build a new school on the site.